In this article we will be continuing with this week’s second selection of affordable jackets, as we mentioned in the previous selection where we looked at some great rain jackets that anyone can afford. This selection is all about soft shells, the versatile jackets which are great for any outdoor activity and provide comfort, weather protection and high breathability, which is their distinguishing feature. We have selected 7 options for you, all of which are under $100 and offer performance and comfort. 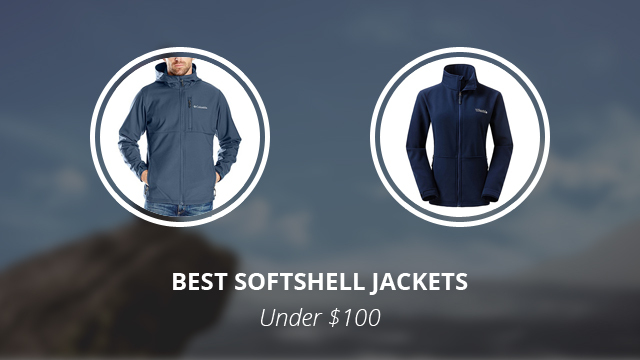 You really don’t have to spend a fortune for a quality soft shell. Without any further ado, let’s get started right away with the jackets that we have chosen for men and then move on to those for women. * Note: The availability of the products in this page (including colors and sizes) might change at any time. Also please check the products materials and features on the various shops before buying. We do our best to assure the accuracy of our articles, but sometimes they might contain errors. The product images shown are for illustration purposes only. The price (under $X) refers to Amazon US. 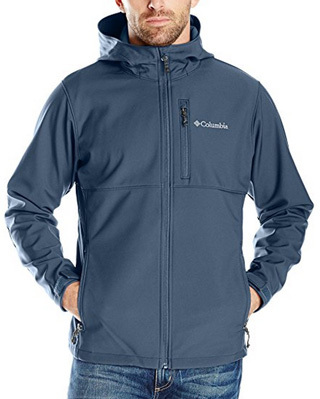 The first jacket is by Columbia, a frequently featured brand in our selections and reviews. This is the Ascender design, which comes with a hooded collar and it is made of 100% Polyester. The shell is Nexgen Contour, which makes it fit much better and adapt to movement easily. It comes with two side pockets and one chest pocket, all of which with zipper closures. The side ones are lined on the inside to quickly warm up the hands. The sleeve cuffs are adjustable with Velcro fasteners, the hem also adjusts with a draw cord and the main zipper is water-resistant. It is a lightweight and thin design, suitable for temperate weather and mild raining, while being highly breathable. It comes in 6 colors: Black, Dark mountain, Graphite, Boulder, Buffalo and Collegiate navy. 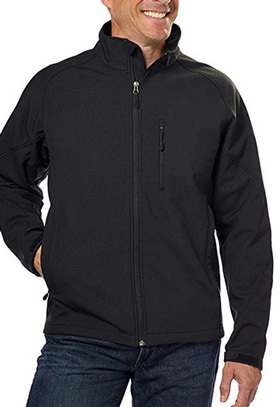 A 3-layer soft shell by Kirkland Signature, this jacket is made of 100% Polyester and it is both wind and water resistant. It comes without a hood but with a medium, stand-up collar that protects the neck. There are three outer pockets, two on the sides and one on the left side of the chest. The side pockets are hand-warmer pockets, lined with fleece to keep your hands warm and avoid the need for wearing gloves. It is a straight-cut jacket, light and comfortable, suitable for a variety of outdoor activities and also suitable to wear as a layer underneath a heavier jacket during winter time. The sleeve cuffs are adjustable with Velcro fasteners and the main zipper is covered by chin guard on the collar to prevent zipper chaffing. This is a breathable jacket which comes in the colors: Sequoia red heather, Olive grey tweed, Black, Asphalt heather, Orange and Heather olive. 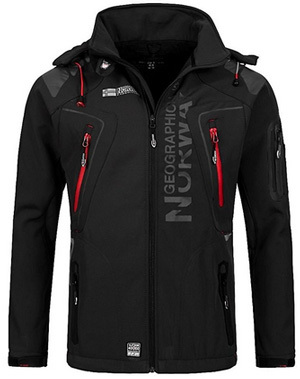 Vantaa is a high-performance soft shell by Geographical Norway. It is highly water-resistant, with a water column rating of 3.000mm and very breathable, too. It comes in a 96% Polyester and 4% Elastane blend, with Turbo Dry Technology shell, which dries quickly and also prevents water droplets from resting on the jacket by causing them to roll off on contact. The collar is hooded and quite high, lined with soft and fuzzy fleece on the inside to provide better warmth and protection. There are two side pockets and one on the left side of the chest and it comes with elasticized, regular sleeve cuffs. 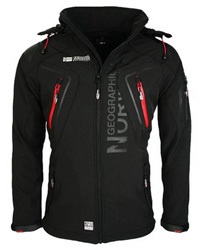 This is a slim fit soft shell jacket which has reflective strips in the front and back to keep you safe in bad weather. 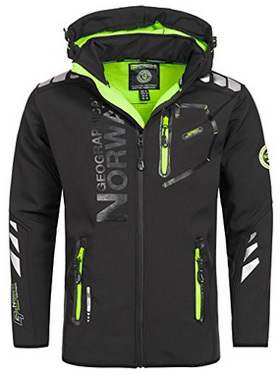 It comes in the color Black, with Neon green inner lining and details. 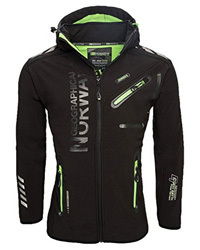 The fourth jacket for men is also by Geographical Norway, the GeNo-5, a functional soft shell that is designed specifically for sportsmen. It comes with several outer pockets and inner ones as well, providing plenty of storage space. It is made of 96% Polyester and 4% Elastane. 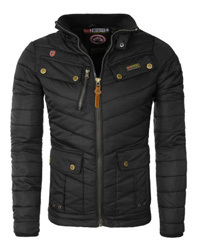 This is a highly breathable jacket, perfect for strenuous activity as it won’t cause excessive perspiration. The collar is high and stand-up, with a hood attached at its base. The hood is adjustable and lined on the inside, while the collar comes with chin guard. There are Velcro fasteners on the sleeve cuffs and 9 options to choose from, the main ones being: Black, White, Red and Blue. The first jacket for women is by Kirkland Signature, a water-repellent and wind resistant soft shell. 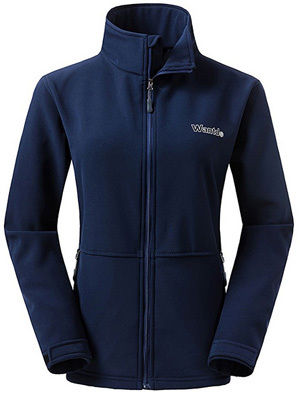 It is made of Polyester and it is lined with soft fleece on the inside for added warmth and insulation. There are two side pockets for the hands and the main zipper is covered by a placket, to further prevent water from getting through. This is a lightweight but warm jacket that works best for autumn and spring, and you can wear it both outdoors and indoors, it’s that comfortable! This is a jacket that ends below the hips, so it covers the back very well when you sit and move around. The collar is hooded, which is also lined with fleece and there are 4 colors available: Cobalt, Red, Fuchsia and Purple. By Wantdo we have picked a very comfortable soft shell, which is made of 95% Polyester and 5% Spandex. The shell is wind resistant but mildly water-resistant and because it comes without a hood, it is best suited for dry weather. 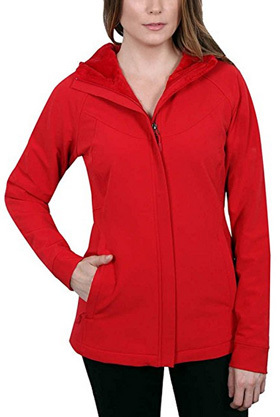 The inner lining is soft brushed fleece, which provides comfort and warmth. The sleeve cuffs are adjustable and the hem is elasticized, so that the jacket will fit much better. The spandex in the fabric helps not only with comfort but also with movement, making the jacket adapt to movement and to keep you warm at all times. It comes with a slightly cinched waist and two side pockets, with zipper closure. There are 6 main colors to choose from: Red, Black, Navy, Rose red, Purple and Grey. Lastly, it’s the Core soft shell by Port Authority. 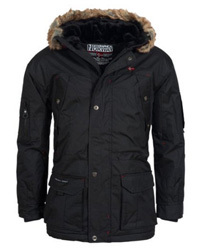 This jacket is made of 100% Polyester and it comes with a medium collar and a water-resistant zipper. It has a water-resistant shell with a water column of 1.000mm and breathability rating of 1.000 g/m2. The inner lining is microfleece, which works very well at insulating and trapping heat inside the jacket. This is a normal fit cut, with regular sleeve cuffs and hip-length. There are two side pockets on the outside and it comes in the color: Very berry, Battleship grey, Black and Dress blue navy.